Negative-stranded RNA linear genome, about 11-15 kb in size. Encodes for 5 to six proteins. Alternatively the ribonucleocapsid can binds to the matrix protein and budding of particles occurs at the cell membrane, releasing new virions. 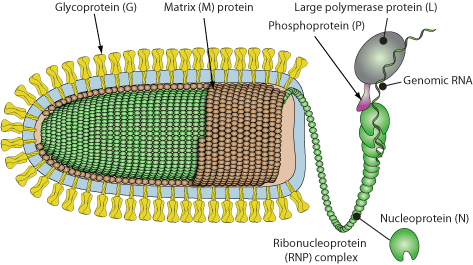 The ribonucleocapsid binds to the matrix protein and budding of particles occurs at the cell membrane, releasing new virions. Viral movement protein 3of RYSV presumably interacts with host plasmodesmata to allow tubule guided movement of viral genomic material from cell to cell without budding.